Who's in your branch of the family tree? 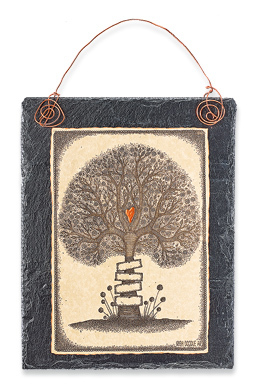 Add your personalization to this flourishing tree in full bloom, accented by a copper heart. Parchment-paper print is mounted on slate, suspended by a swirling copper wire. Available with 3, 4, 5 or 6 spaces; specify your choice. Approx. 6 3/4" x 8 1/2"; natural slate will vary. Handmade in Ireland. Please note: GaelSong does not personalize this item, that must be done by the purchaser or recipient. Thank you! Discontinued; limited styles and quantities available! Very pleased. The plaque was exactly as described in materials and size. If not hung on a wall, I can envision setting it in an upright holder on a table or desktop.